It was in the 1960s when a now immortalized psychiatrist by the name of Arraon T. Beck was treating individuals for depression and wanted to verify the legitimacy of the psychoanalysis techniques, popularized by Sigmund Freud, he was using to treat his patients. Although Beck began carrying out a number of studies and experiments with hopes of validating his treatment methods, he would soon discover that the strategies had little to no positive affect on his depressed patients. Upon uncovering this stunning revelation, Beck had no other option than to develop new and effective ways to help those he was treating. Over time, with the help of other celebrated psychological figures like Albert Ellis, Beck was able to developed the therapeutic treatment strategy of Cognitive Behavioral Therapy (CBT). Since Aaron Beck first began treating patients suffering from depression with his newly developed therapeutic techniques in the late 60s and early 70s, CBT has evolved into one of the most highly regarded therapeutic treatment strategies for mental health disorders. Within the modernized framework of CBT today, there are a variety of therapeutic activities that psychiatrists use to not only help their patients overcome depression, but other prevalent health disorders such as anxiety, obesity, anger and addiction. While it may be easy to assume that CBT should only be used by medical professionals treating mentally ill patients, this just simply isn’t the case. In fact, because the framework of CBT is built upon a number of foundational psychological truths that apply to all of humanity, each and everyone of us has the ability to use CBT to push ourselves towards achieving our personal development goals. Before we begin looking at the numerous ways we can use Cognitive Behavioral Therapy exercises and tools for our personal development endeavors, it’ll be important to gain an understanding of the treatment strategy’s foundational framework. For those who have no prior knowledge of CBT, the first thing that should be pointed out is that CBT therapists work with patients at both the level of cognitions and behavior, hence the C and B of CBT. Beyond this most basic premise, it’ll be important to briefly examine four concepts that act as the groundwork for which CBT is built up: The CBT triangle, the cognitive model, automatic thoughts and dysfunctional thinking. In the eyes of CBT therapists, the CBT Triangle represents one of the foundational psychological truths that governs all of humanity. When CBT therapist begin working with patients, they form their treatment strategies with the understanding that every individuals’ thoughts, emotions, and behaviors are continuously affecting one another at all times. If an individual begins to think negatively, for example, there will be negative repercussions at the emotional and behavioral levels. Similarly, if an individual behaves in a harmful manner, there will be negative ramifications at the cognitive and emotional levels. Since our cognitions continuously affect our emotions and behaviors, our emotions continuously affect our behaviors and cognitions, and our behaviors continuously affect our cognitions and emotions, each of us can take life-affirming action at the cognitive and behavioral levels in a way that increases our feelings of subjective well-being. The second important model that we need to explore is the cognitive model because it shows us how particular situations and circumstances lead to a chain reaction of thoughts, body sensations, emotional reactions, and behaviors. In the eyes of CBT practitioners, stimuli in our environment naturally gives rise to thoughts in our head which in turn leads to emotional and behavioral responses. If an individual suffering from social anxiety is put into a high pressure social situation, they will assuredly have anxious cognitions that guides their behaviors. Oftentimes, in instances such as these, as the thoughts and emotions of social anxiety negatively influence one another, individuals will take behavioral steps to remove themselves from the situation. Lastly, the CBT concepts of automatic thoughts and dysfunctional thinking should be pointed out because it is from here were therapists begin working with mentally ill patients. While psychologists and psychiatrists of different schools of thought won’t agree on everything, virtually all of them acknowledge the fact that there is a seemingly ceaseless flow of automatic thoughts stemming from our brains. When working with individuals suffering from mental illness, a CBT therapist will point the finger towards overtly negative cognitions, or dysfunctional ways of thinking, as being the culprits causing emotional and behavioral disturbance. It is certain that CBT therapists are able to provide their patients with the best possible treatment strategies by working with them on an individualized basis. This, however, doesn’t mean that mental illnesses present themselves in completely unrelated ways. In fact, many mental health disorders, which can be influenced by genetics and/or life experiences, develop in a similarly systematic manner. For those suffering from anxiety or depression, for example, a negative event or set of sequential events typically leads to the onset of cognitive, emotional and behavioral symptoms. When an individual is unable to stop and reverse their initial anxious or depressive response, they’ll begin spiraling downwards towards a full blown mental health disorder. The previously examined CBT triangle helps illustrate the downward spiral of mental health disorders because it shows us how problematic thoughts, behaviors, and emotional responses can repetitively influence one another until the point of individuals needing medical intervention. The detrimental cognitive patterns of an individual who prematurely loses a loved one, for example, can negatively affect their emotions and behaviors in a way that leads to a major depressive disorder. Of course grieving the loss of a loved one is healthy to a certain degree, but if the affected individual is unable to break the cycle of cognitions, emotions and behaviors negatively affecting one another, they’ll spiral downwards towards a state of pure dread. To help them overcome their depressive state, a CBT therapist will recommend a variety of cognitive and behavioral activities that reverse the direction of the downward spiral. It should be pointed out that while CBT therapists first work with their patients’ surface level cognitions and behaviors, they’ll oftentimes have to help them discover, challenge, and change core beliefs and underlying assumptions about the world to move them in the direction of stabilized mental health. Unlike a number of other therapeutic treatment strategies, Cognitive Behavioral Therapy aims to limit patients’ reliance on medications and instead focuses on creating cognitive and behavioral changes through a wide variety of exercises and activities. After creating a case formulation that’s based upon information derived in initial therapeutic discussions with their patients, a CBT therapist will begin recommending a variety of cognitive and behavioral practices found within the toolbox of CBT. In the eyes of CBT practitioners, the exercises found within this toolbox are of outmost importance because the longterm objective is to supply patients with the necessary knowledge and resources to act as their own therapists in the future. While there are a variety of exercises and activities that may be most appropriate for particular medical cases, or favored by particular therapists, there is a standard set of CBT strategies that, because of their effectiveness, are commonly used by all. In fact, it is these standardized tools and systematic methods that we can use to enhance the probability of achieving our goals. In the following section, we will more closely examine the CBT tools from a personal development perspective, but it will first be useful to gain an understanding of how a CBT therapist structures their treatment methods over time. As you’ll discover, the strategies used to reverse the downward spiral associated with mental illness are in effect the same ones that mentally stable individuals can use to reach their goals. After developing an initial case formulation, the therapist and patient will work together to create a set of SMART Goals (Specific, Measurable, Achievable, Relevant, & Time-Bound) and devise an actionable plan that helps moves the patient towards the accomplishment of their desires. Typically, the therapist and patient will meet on a regular basis to review and update the individual’s case formulation, goals, and action plan. Two of the most important CBT strategies are the practices of self-monitoring and progress evaluation. By increasing self-awareness and regularly assessing one’s state of being, individuals are able to discover faulty cognitions, patterns of dysfunctional thinking, limiting core beliefs, and behavioral hinderances. With this new insight, CBT therapists will guide their patients towards taking steps to overcome whatever the mental or behavioral obstacle may be. There are a variety of CBT tools the focus on challenging and changing patients’ dysfunctional ways of thinking. Since CBT therapists are taught to utilize a top-down approach, initially working with patients’ thoughts, the cognitive exercises and activities are of great importance. To reverse the downward spiral of mental health disorders, patients learn about the process of cognitive restructuring and begin using tools such as a dysfunctional thought record and the ABCD Method. In addition to cognitive exercises and tools, CBT therapist teach their patients a variety of behavioral strategies that help convert problematic thoughts and limiting beliefs into more life-affirming alternatives. By taking definitive action that goes against what one may tell themselves internally, individuals are able to compile evidence that goes against detrimental cognitive patterns. A few noteworthy examples of behavioral tools are behavioral activation, behavioral rehearsal and behavioral experiments. There are additionally a variety of innovative third-wave therapeutic strategies that derive from CBT and provide the newest additions to the CBT toolbox. While not all CBT therapists will use what are considered third-wave exercises and activities, it is worth noting them here because they assuredly can help us achieve out dreams. Notably, particular tools found in third-wave therapies such as Acceptance and Commitment Therapy (ACT) and Mindfulness-Based Cognitive Therapy (MBCT) can be useful for our endeavors. Since CBT is based upon a variety of psychological truths that apply to all of humanity, each and everyone of us has the ability to use CBT strategies to enhance our levels of subjective wellbeing. 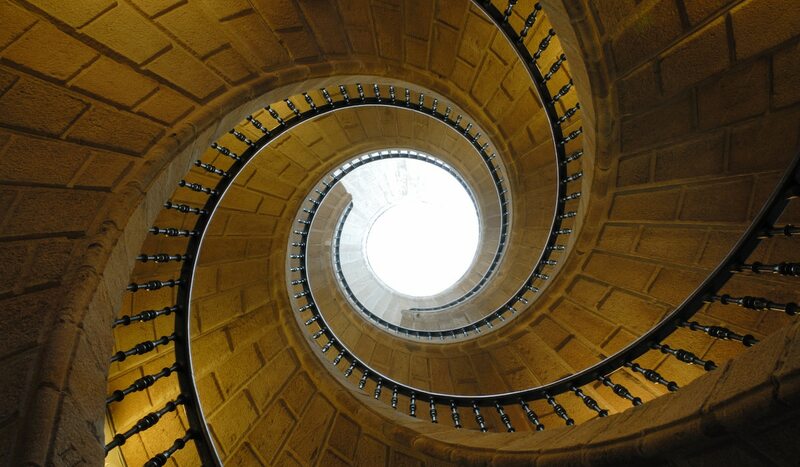 In the same way a CBT therapist helps their patients reverse the downward spiral of mental health disorders, we can use the tools of CBT to spiral ourselves towards success. One logical way to think about using CBT for personal development is to envision a scale ranging from -5 to 5 with the range of -5 to 0 representing individuals who are, to various degrees, suffering from a mental illness and the range of 0 to 5 repressing mentally healthy individuals pursuing higher levels of life satisfaction. It is certain that by implementing CBT strategies into your self-improvement plan, you’ll quickly learn how positive thoughts, emotions, and behaviors positively affect one another in a way that spirals you towards success. Let’s now examine CBT from the perspective of personal development. While there are a seemingly endless number of personal development goals that you can use CBT strategies to achieve, the first step of the process will be to determine what success is for you. Unfortunately, all too many people fall victim to assuming that material possessions, money, and social status will give them the levels of life satisfaction they desire, only to discover the limited levels of happiness they obtain from them. When you take the time to define success, it’s important to remember that these traditional measures of objective achievement shouldn’t be misconstrued with the more important measure of subjective well-being. In fact, the best approach to take when defining success may be to decide on a middle path that intertwines a mixture of professional and material success with life-satisfaction and contentment. Once we have defined what success is, we can begin creating a number of SMART goals. Generally speaking, we may consider setting goals in a number of the following categories: Spiritual, Personal & Intellectual, Health & Fitness, Financial & Professional Development or Relationships & Communication. Additionally, although personal qualities such as emotional and social intelligence may be a bit harder to measure, these are undeniably some of the most important and rewarding goals to aim for because they’ll be needed to achieve truly extraordinary things. Only by committing yourself to equally focusing on intrinsic goals and desires, in addition to external successes, will you be able to find the levels of life-satisfaction you crave. Before moving on to looking at action plans, it is worth reiterating the importance of setting your objectives with the SMART goals criteria. There is no reason to be discourage if you are aiming to achieve something truly momentous, you’ll just have to chunk the bigger objective down into smaller, measurable, time-bound pursuits. The next step in the process of using CBT for success, which can be considered the last step in this initial phase, would be to create a manageable action plan that allow you to monitor your progress. While deciding upon how to breakdown particular objectives will be an individual preference that is largely based upon circumstances and schedule, the most important thing is to regularly review and update your specific, measurable, and time-bound action plan. As we previously discussed, the practices of self-monitoring and regular evaluation are at the heart of CBT. Just as individuals are able to overcome mental illness by becoming aware of and challenging problematic cognitions and behaviors, each and everyone of us can vastly improve our probabilities for success by monitoring and evaluating our thoughts and the actions we take. One great practice that can vastly increase one’s awareness of the prohibitive thoughts, limiting beliefs, and detrimental behaviors that are acting as road blocks on the path towards success is the third-wave treatment strategy of mindfulness meditation. While the practice of evaluating one’s self is never an enjoyable process, it is an important tool used to increase individuals’ chances of success and levels of subjective well-being. By regularly evaluating your progress and updating your action plan, you’ll assuredly stay focused on your desired objectives and also find innovative ways to achieve your goals in the most timely manner possible. Additionally, because setbacks and failures are a very real part of the achievement process, it’ll be important to learn how to view obstacles and disappointments as nothing more than opportunities to learn and grow. Cognitive Tools: When individuals undertake the practices of self-monitoring and personal evaluation, they often find dysfunctional ways of thinking and problematic habits of mind that prohibit them from succeeding. If and when you find these achievement prohibiting mental patterns, you can transform them by using the process of cognitive restructuring, or the practice of identifying, challenging, and transforming negative thoughts into more life-affirming alternatives. The dysfunctional thought record and ABCD model we briefly touched on above can guide you towards finding and transforming success prohibiting cognitions. Behavioral Tools: While working to transform dysfunctional ways of thinking and problematic habits of mind is undoubtedly a great strategy, CBT therapists will often have to help their patients discover and release limiting core beliefs found below surface level cognitions. Since it unlikely to succeed without having complete confidence in ourselves, letting go of the negative beliefs we hold about ourselves is imperative for success. Fortunately, we can find verifiable evidence that goes against the personal beliefs that no longer serve our needs by undertaking behavioral exercises and activities. Behavioral activation (increasing positive reinforcement & decreasing negative behavioral patterns), behavioral rehearsal (practicing for upcoming situations & circumstances), and behavioral experiments (information gathering exercises used to test the validity of thoughts & beliefs) are three prevalent activities worth pointing out. 360-Degree Feedback: If you desire to improve your levels of social-emotional skills, your abilities to communicate with others, or your professional ranking, one helpful tool is that of 360-degree feedback or multi-source feedback. While 360-degree evaluations are most commonly used in professional settings, they can also be useful to gauge how others view us in social, family and community environments. By having others whom you regularly interact with fill out an evaluation assessment of your strengths and weakness, you can gain valuable insight into the ways others see you and discover undeveloped skills that can take you to the next level. It’s important to not become upset or angry with anyone particular person’s answers, as all feedback should be accepted wholeheartedly and utilized for growth. Values Clarification Exercise: The last tool that we will look at, which is great for individuals struggling to find meaning in life, comes in the form of a popular Acceptance and Commitment Therapy practice known as the values clarification exercise. Because it is quite easy to approach personal development with the faulty notion that money, success, better relationships, and status are the things we should be after, clarifying your values and determining the type of person you want to be can help guide you towards finding the goals that will truly increase your levels of subjective well-being.